Membership in the Naval Academy Parents Club of Central Pennsylvania is open to all families and friends of the United States Naval Academy, Appointees, Midshipmen, Graduates of the Academy, Blue and Gold Officers and anyone interested in supporting the Mission of the USNA Parent Club. **NOW IS THE TIME TO RENEW YOUR PARENT CLUB MEMBERSHIP FOR 2018-2019!! 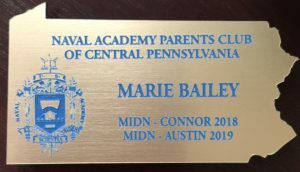 If you would like to order a name tag to be worn at our local club events and while visiting the Naval Academy, please contact club Treasurer Nathan Lightner via email at: treasurercentralpa@napc.usna.com They are very nice and attach via magnet– so no holes in your clothes!